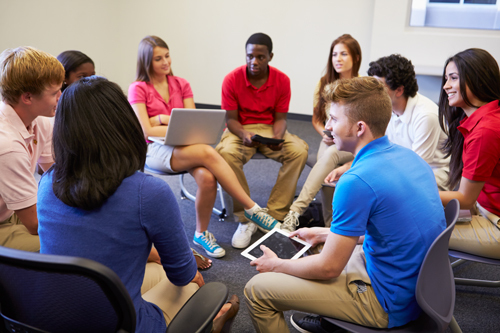 The impact of students’ life experiences on their behavior has garnered increasing attention as schools strive to develop more supportive academic environments that address the needs of at-risk youth and facilitate continued academic engagement. 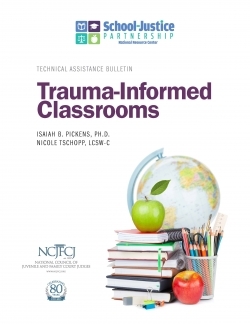 Few events outside the classroom have as profound an impact on multiple domains of student development as traumatic life experiences. 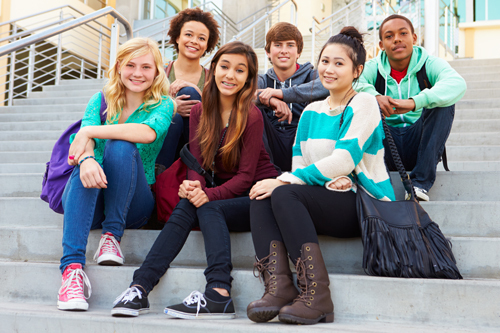 Juvenile courts nationwide handle cases referred by schools for truancy or behavioral incidents. Since 2012, the National Council of Juvenile and Family Court Judges (NCJFCJ) have trained jurisdictions on strategies and policies to reduce the number of referrals to the juvenile justice system for school-based behaviors. Prior to the passage of the Gun Free Zone Act of 1994 (GFZA), school administrators and educators were largely responsible for addressing student misbehavior in schools. However, since the implementation of GFZA, an increasing number of school-related issues have instead come before the juvenile courts due to highly punitive school policies and practices. Throughout the 1990s, the rise of zero-tolerance school discipline policies resulted in the widespread adoption of strict and mandatory responses for a large range of misbehavior in school. An unintended consequence of these policies and practices were youth with behavioral health needs put at an increased risk for exclusionary discipline and school-based arrests. 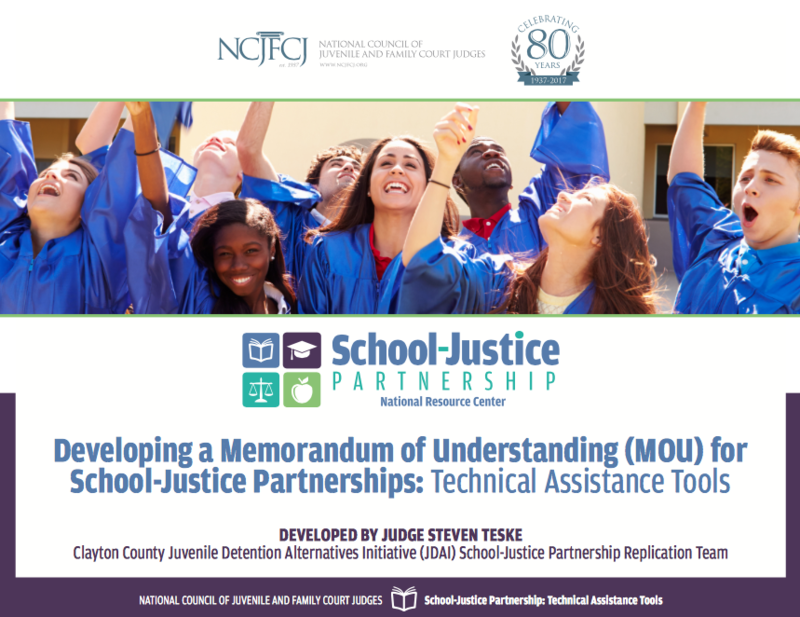 A memorandum of understanding (MOU) is a critical document in establishing coordinated efforts in a school-justice partnership. 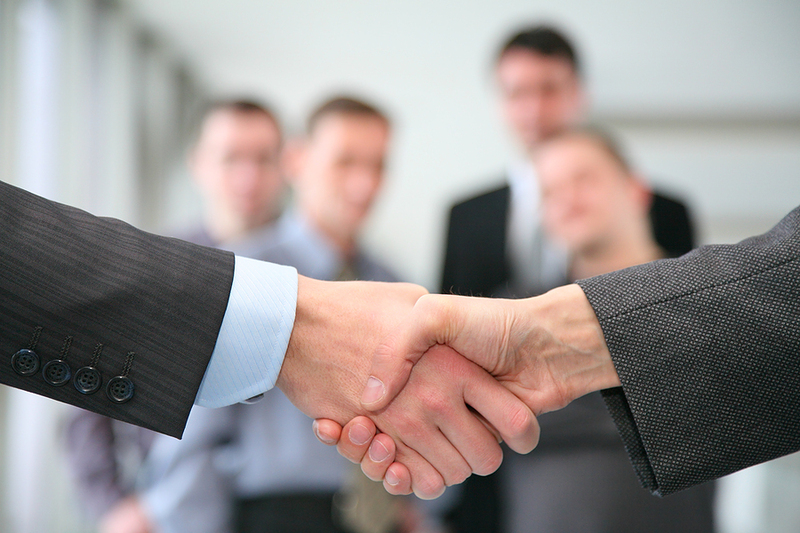 An MOU is a multilateral agreement among multiple parties intended to express a common vision and line of action. 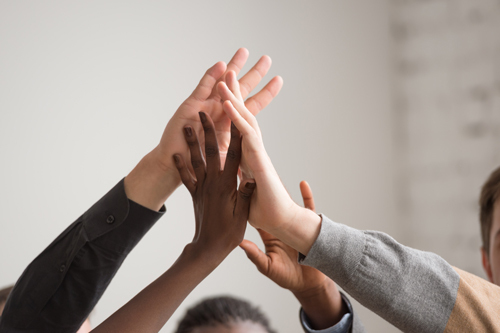 MOUs in school-justice partnerships represent a collective commitment among schools, courts, and other relevant agencies, to adhere to specific principles and share responsibilities for the collaborative’s engagements. The zero tolerance policies that were adopted by many local and state education agencies in the 1990s had the unintended effect of unnecessarily introducing low-risk youth to the juvenile justice system for disruptive behaviors that are very typical of adolescence. Despite overall decreases in juvenile delinquency referrals nationally, including arrests of juveniles for violent offenses, the proportion of referrals for non-violent acts and relatively minor misdeeds that derive from school-related incidents has remained high in many jurisdictions. 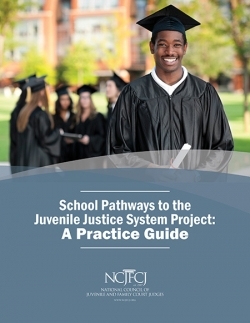 The NCJFCJ has published this guide as part of a larger project addressing school discipline referrals to the juvenile justice system. The project aims to reduce the number of referrals to the juvenile justice system for school based behaviors through the establishment and collaboration of judicially led court/school partnerships. The practice guide is intended to provide the multi-system collaborative in each of the 16 demonstration sites with thorough and thoughtful guidance on implementing judicially led collaborations to address "school pathways to the juvenile justice system." 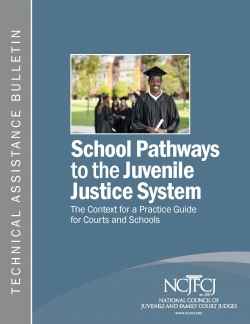 The NCJFCJ has published a Technical Assistance Bulletin on the School Pathways to the Juvenile Justice System: A Context for a Practice Guide for Courts and Schools as part of a larger project addressing school discipline referrals to the juvenile justice system. The project aims to reduce the number of referrals to the juvenile justice system for school based behaviors through the establishment and collaboration of judicially led court/school partnerships. The bulletin was published to provide a context for courts and schools regarding the need to reduce the number of referrals to the courts, along with a history and impact of zero tolerance policies. The growing debate over school discipline has led many educators and policymakers to question the value of punishments involving suspensions and the existence of zero-tolerance policies. Many schools and educators are working in local collaborations to examine and reform disciplinary practices. 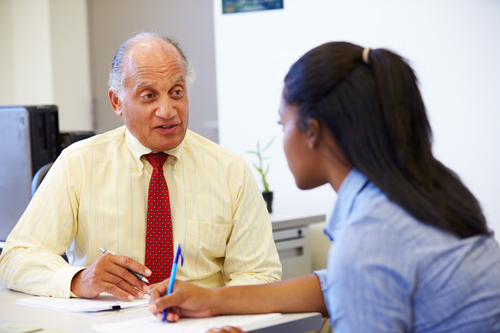 School discipline is often overlooked as a critical component for academic success. Schools and educators should ensure that all students receive equal educational opportunities by creating and overseeing the implementation of policies that improve school climate, promote effective alternatives to exclusionary discipline, and reduce the number of students referred to law enforcement and juvenile justice systems. School-based policing is the fastest growing area of law enforcement. The primary role of law enforcement personnel in schools is to provide safe learning environments, but what role does law enforcement play in managing disruptive students and enforcing student codes of conduct? Law Enforcement and School Resource Officers (SROs) should be engaged in training to learn how to manage adolescent behaviors. Law Enforcement and SROs should partner in local collaborations with schools, mental health providers and juvenile justice representatives to minimize the use of suspensions, expulsions and referrals to the juvenile justice system, while implementing positive school discipline policies. Judges, prosecutors, public defenders, and probation have very important roles in school-justice partnerships. Juvenile court judges should utilize judicial leadership and engage in system collaboration with schools, law enforcement, mental health providers and community organizations to reduce referrals to the juvenile justice system for school-based misbehaviors. Prosecutors, public defenders and juvenile probation play an important role in the school-justice partnership by screening and diverting referrals from schools for non-serious offenses from entering the justice system. Juvenile justice stakeholders should contribute to policy development for appropriate school-based referrals and procedures to the juvenile court. Many youth become involved in the juvenile justice system due to underlying mental and behavioral health issues. Traumatic events in the life of a child that have not been properly addressed by a mental health professional can be the root issue of problem behaviors in school. Through the actions of schools and educators, many youth who are at-risk can avoid involvement in the justice system through appropriate screening and referrals to community resources to treat behavioral issues. Multi-system coordination among schools, law enforcement, mental health providers and juvenile justice system stakeholders is vital to creating effective policies to keep youth in school. Bringing multiple stakeholders from different parts of the system together to co-create a vision and strategy will aid in the collaborative process. The goal of these partnerships is to achieve positive school discipline reforms and significantly reduce the number of student suspensions, expulsions, and referrals to court for non-serious offenses through the collective development of school discipline reform policies and programs. The Office of Juvenile Justice and Delinquency Prevention partnered with the Department of Education and the Substance Abuse and Mental Health Services Administration (SAMHSA) to implement a multidisciplinary initiative to improve school climates, respond early and appropriately to student mental health and behavioral needs, avoid referring students to law enforcement and juvenile justice as a disciplinary response, and facilitate a proactive and supportive school reentry process in the rare instances in which a youth is referred. There are several federal initiatives that may be able to provide information that can support school-justice collaborations, identify the latest research on effective programs and interventions, profile local communities across the U.S. that are implementing programs to support positive school climates, and/or identify funding opportunities to support implementation of local initiatives. Some of these federal initiatives are able to provide technical assistance and support to local jurisdictions. Below is a sampling of federal initiatives with similar goals and programming related to the School-Justice Partnership Project. 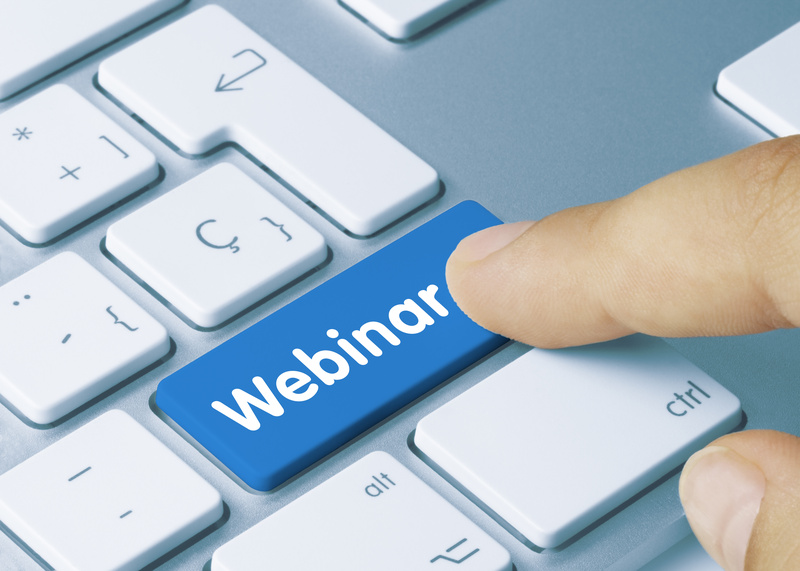 The School-Justice Partnership Project is pleased to house a variety of recorded web-based webinars that are beneficial and intended to enhance the collaboration and coordination among schools, mental and behavioral health specialist, law enforcement and juvenile justice officials. Recorded web-based webinars will be housed in our library to provide key stakeholders with the knowledge and skills to achieve positive school discipline reforms and to improve the lives of students to succeed in school and prevent negative outcomes for youth and communities.